Welcome to our special page for our 2018 Fall Adult Education Class, in whch we are studying the classic book by Fr. Alexander Schmemann, 'For The Life Of The World'. NOTE: SVS Press has announced the availability of the new edition of 'For The Life Of The World', in both paperback and hardcover. This updated edition of Fr. Alexander Schmemann’s classic text includes a new foreword by Dr. Edith M. Humphrey, along with new explanatory notes and an index. Learn more here, including links to order the paperback and hardcover editions. Scroll down for Class Notes and Discussion Questions from Father Steven (in reverse chronological order), our flier and info on the class, with links to order this classic text, as well as two fascinating videos on the life and importance of Protopresbyter Alexander Schmemann. We concluded this year's Fall Adult Education Class with a pretty intense discussion of an Orthodox Christian understanding of death. And this understanding is based on Christ's victory over death as eloquently presented by Fr. Alexander Schmemann. The resurrection of Christ is God's response and "solution" to the "last enemy" that casts a shadow over life. I hope everyone shared my enthusiasm and sheer joy in reading a real "classic" that reminds us of the depth of beauty of Orthodoxy. A well of "living water" that we can draw on to quench our spiritual thirst throughout all the days of our life - and "beyond" of course! This second one was recently published posthumously and it offers a look at the actual funeral service and other rites with the view of rediscovering the paschal message of the funeral service. I really enjoyed this Fall's class - and hope you did also! We had around twenty-five participants all together "in and out" for the six sessions which was encouraging. We will read and discuss Ch. 5 together next Monday evening (unless it is then that I go out-of-town. I will keep everyone informed). "The Mystery of Love" is primarily concerned with the Sacrament of Marriage. Fr. Alexander clearly has some ideas of the "feminine" that would not be accepted today or seen as perhaps too idealistic or simply "outdated." That does not make his ideas wrong, so we need an open-minded exploration/discussion of his writing. + We always start with the opening paragraph. Here, again, is a good review of Fr. Alexander's notion of sacrament as a transformative event. + Further in the opening section, what do he mean that marriage itself is "fallen and distorted?" But are we approaching that analysis in a positive way? + Fr. Schmemann begins by contrasting the approach of the West to the Virgin Mary and our own Orthodox approach. What is the basis of this contrast? Is it convincing? + How does Fr. Schmemann understand and present the term Virgin? (p. 86) And then Mother (p. 87)? + How was the Sacrament of Marriage "desacramentalized" according to Fr. Schmemann? + There are three basic meanings behind the rite of crowning: The family as a "little church" (p. 89); as martyria (p. 90); and pointing to the Kingdom (p/ 91) Good themes to further explore. + What is the priesthood express? What does it mean to be a "layperson?" + One more time with the "abolition of religion" on p. 93! Again, think of other questions that you may have; and think of your own "favorite" passages in this chapter, and be prepared to explain why. Looking forward to next Monday evening's Session V! + What has led to a reduction in our understanding of a "baptismal Liturgy" according to Fr. Alexander? How does the preoccupation with validity reduce our understanding and experience of the Sacraments? + How were Baptism and Pascha related in the early Church? + How does the "Liturgy of the Catechumens" relate to Baptism? + What is the purpose of the exorcisms? How does the demonic manifest itself in the world? + What does Fr. Schmemann mean with a sentence like this: "The world from which the human being has received his life, and which will determine this life, is a prison?" + What is the dual meaning of water (opening paragraph)? How does the baptismal service reveal this dual meaning? + Here is a good sentence/thought to discuss (bottom of p. 72): "The blessing of water signifies the return or redemption of matter to this initial and essential meaning." + What does it mean to resist the "self-sufficiency" of the world? + How is Chrismation/Confirmation the "personal Pentecost of man?" + How does the Sacrament of Confession (Fr. Schmemann uses the term "penance") relate to the Gift of forgiveness? + How is Confession/Penance a return to "the newness of life?" These are just a few questions that we can discuss. We again have a very rich chapter ahead of us on Monday! Please remember to highlight one or two of your "favorite" passages. Another good session on Monday evening, or so I believe. Time is a fascinating topic, and when thought about in the context of our Orthodox Christian Faith, we experience the joy of realizing that time has been "sanctified;" meaning that time itself is moving toward the eschaton, its fulfillment in the Kingdom of Heaven. This, in turn, is all based on the events of the Incarnation, Death, Resurrection and Ascension of Christ, Who entered time on our behalf. An awareness of this is a source of great joy as Fr. Alexander keeps repeating. Not superficial or "natural" joy; but a deep and abiding joy: "For, behold, through the Cross joy has come into all of the world." Trying to supply the group with more about Fr. Alexander Schmemann on a biographical basis, I am providing a link to another wonderful article, this time by one of Fr. Alexander's longtime colleagues and friends, Fr. John Meyendorff, a brilliant historian, theologian and patristic scholar. Fr. 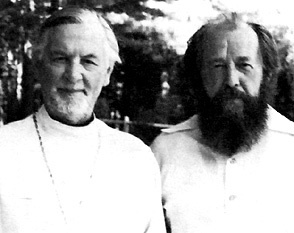 John was another of my great teachers at St. Vladimir's Seminary. He later became the dean of the seminary until his own untimely death in 1993. I was able to also attend his funeral. The article is very-well titled: "A Life Worth Living." This version has many interesting photos of some of the key persons in Fr. Alexander's life, including many who helped form his intellectual and spiritual life. It also gives some background on the formation and development of Orthodoxy in North America and Fr. Schmemann's key role in that history. Hope you will eventually read through it. If it raises any areas of interest that you would like to explore, please bring that up next Monday evening. I hope to provide questions and discussion points on Ch. 4 "soon." We will turn to Baptism and Confession in that chapter. + What is behind the title of this chapter? + A recurrent theme of the book is how Christianity was transformed "into religion." The second paragraph in sec. 2 deals with this theme yet again. Let's make a point of going through this as presented in that paragraph. + What does Fr. Schmemann mean by "no time" in the following paragraph in sec. 2? + Sec. 3 is a particularly insightful passage, in which Fr. Schmemann relates the "seventh day" with both the "first day" and the "eighth day" of the weekly cycle. How do these various "day" interrelate one with another? How and why is the Eucharist on the Lord's Day the key to understanding these various days and what they "symbolize?" + What is the purpose of a Feast? Why then is a true ecclesial feast more than an interruption into time of a "holy day?" Why does Fr. Alexander ultimately claim that joy is a "gift (p. 55)?" + In sec. 5, Fr. Schmemann on what basis relates "natural" time, "historical" time, and "eschatological" time. Why is Easter the very "sacrament of time?" + In sec. 6, how is the service broken down in order to relate its over-all manifesto of the day and time itself? This is Fr. Schmemann's famous tripartite intuition of time and its fulfillment in Christ as the very meaning of time. + In sec. 7, on p. 64,, the second full paragraph, we hear of living "between" a series of time-related poles, from that of the day to that of our lives. What does this disclose to us? Great themes lost in the hustle and bustle of daily living. That is why such discussions are so important for us. We will try and get to these on Monday evening! The second session of this year's Fall Adult Education Class will take place on Monday evening , October 29, at 7:30 p.m. in the Education Center. The first session was quite well-attended, and I hope we continue in that spirit. + In the opening paragraph, Fr. Schmemann that when the world killed Christ, the "world itself died." What does this mean? Is it an exaggeration? (It may take all of sec. 1, to form an answer to those questions). + In sec. 2, Fr. Schmemann famously wrote: "Of all accusations against Christians, the most terrible one was uttered by Nietzsche when he said that Christians had no joy." We can discuss Fr. Alexander's further discussion of joy and the prominence he gives to joy in relation to the Eucharist. + Somewhat provocatively, Fr. Schmemann wrote (top of p. 26) that, "The first condition for the understanding of Liturgy is to forget about any specific "liturgical piety." What does this mean? How can "liturgical piety" possibly act against us while approaching the Liturgy? + At the beginning of sec. 3, Fr. 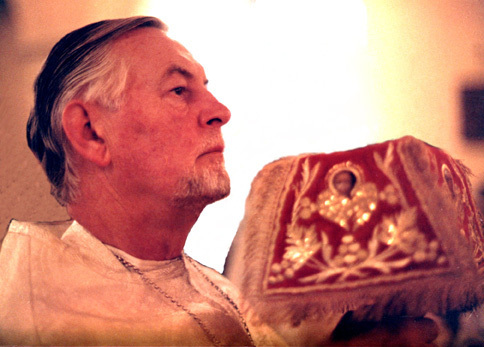 Schmemann writes: "The liturgy of the Eucharist is best understood as journey or procession." What is the destination or goal of this journey? The opening of Sec. 4 will assist us in this discussion. + In sec. 5 we read, "The next act of the liturgy is the entrance ..." What is meant by this? + Let's spend some time on Fr. Alexander's discussion of the meaning of :"bread and wine" in sec. 7. + And the same for the liturgical phrase of "Let us lift up our hearts" in the short, but compelling, sec. 9. The word anaphora is used in this section. What does that word mean? + We can also discuss the great Eucharistic Prayer that is found on p. 38 (for those with Kindle version, this is in sec. 10). + Why is Fr. Schmemann so critical of "scholastic theology" and how it tries to explain the mystery of the "making" of bread and wine the Body and Blood of Christ? This is the theme of sec. 13. + What does it mean to "depart in peace?" Obviously, this is too many questions! We may have to be selective; or we may need to spend two sessions on this key chapter. We will see where the Spirit leads us on Monday evening. Looking forward to the class and to your presence! Class Notes for Session 1 and Beyond . . .
As announced, our Fall Adult Education Class will begin next Monday evening, October 22. As we will be reading, studying, and discussing Fr. 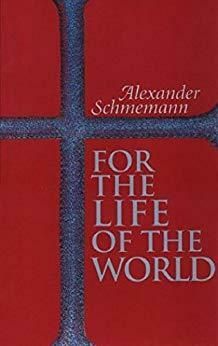 Alexander Schmemann's For the Life of the World, I will try and provide some questions and/or discussion points that all participants can think over and prepare in advance. This is a very rich book that I am assuming will provide us with an endless stream of insights that will further generate a good deal of discussion. It is actually a rather provocative book that challenges many uncritical assumptions that we may hold about various aspects of our Orthodox Faith. And that, of course, is a good thing. The book has seven chapters that we will have to work into a six-week framework. Looking ahead, I believe that we will combine chs. 6 & 7 in our final session. There is then the issue of the two appended chapters. The second appended chapter, "Sacrament and Symbol" is, in the words of Fr. Alexander, written in a different "key." This is fairly technical discussion that we may not address head on, so to speak. Please read this chapter on your own and at your own pace. However, the first appendix chapter - "Worship in a Secular Age" - offers Fr. Alexander's classic analysis of the distorting effects of "secularism" on the life of the Church, and on how we relate to the Church and approach worship as we are the ones living in this "secular age." This chapter is a "must read" to this day, even though written in 1971. In a sense, this chapter will provide something of a "backdrop" for all of our discussions. So, I would suggest reading it as soon as possible to be aware of some of the issues involved. Chapter One has the title given for the whole book, "For the Life of the World." + How does Fr. Schmemann turn on its head, the aphorism of the atheist philosopher, Feuerbach, that "man is what he eats?" What is the role of food and drink in a sacramental vision of the world? + Toward the end of sec. 2 of the chapter, Fr. Schmemann describes a human being as homo adorans. What does this mean and imply for our lives and relationship with God? + In sec. 3, Fr. Schmemann has a particular interpretation of the biblical story of the Fall in Gen. 3. In this perspective, how does food now refer to death and decay and not life and communion with God? + Why does Fr. Schmemann refuse to contrast the "sacred" and the "profane?" What is wrong with "religion," leading Fr. Alexander to famously say that Christ "has inaugurated a new life, not a new religion;" and that Christianity is the "end of religion?" Hopefully, these few questions will "get us going" on our initial discussion of Ch. 1 next Monday evening at 7:30 p.m.
On Monday evening, October 22, we will begin our annual Fall Adult Education Class. And, as in the past, this class will be comprised of six sessions, thus ending on Monday, November 26. 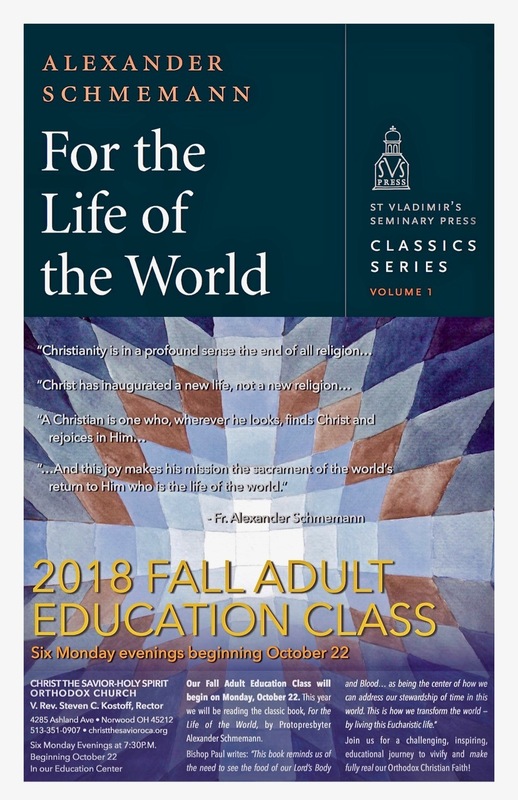 I am very much looking forward to this year's class because we will be reading a contemporary Orthodox classic, For the Life of the World, by the late Fr. Alexander Schmemann - of blessed memory we should add. This year will be the fifty-fifth anniversary of its publication in America, so it is most appropriate to read this book together as a group and discuss the seemingly endless stream of insights that Fr. Schmemann imparts through his inimitable style. (This year is also the thirty-fifth anniversary of his death in 1983). There is no doubt that this book has had an enormous impact on countless Orthodox — and for that matter, non-Orthodox — Christians since its initial publication. In fact, many members of the Orthodox Church today will point back to the impact this book had on them, thus leading them to the Church as a result. 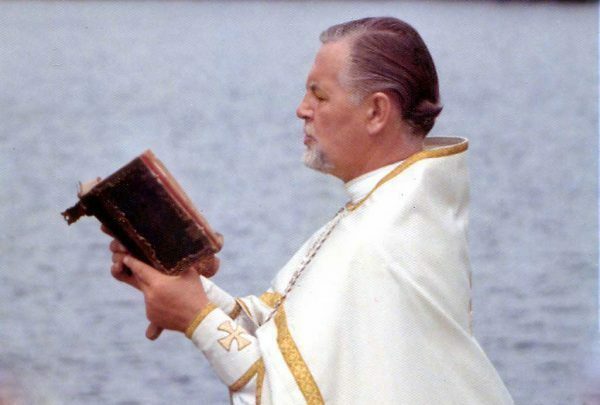 Although a "cradle Orthodox" myself, this book was a "life-changer" in my own spiritual development and was a key factor in my decision to enter St. Vladimir's seminary and study under Fr. Schmemann who was dean during my three years there. That in itself was an unforgettable experience. The All-American Council in St. Louis just this past summer had as its central theme, "For the Life of the World." These are the words of Christ from the Gospel (JN. 6); but nevertheless this is a clear allusion to the title of Fr. Alexander's famous book that more than any of his others enables us to grasp his essential vision for the Orthodox Church in America: simultaneously sacramental, eucharistic and eschatological. And indeed, his son Serge addressed the entire body of assembled delegates and delivered a vey moving tribute to his father. Further, Metropolitan Tikhon wrote a long extended essay of 60+ pages that was clearly linked to Fr. Schmemann's book, in that it was entitled "Of What Life Do Speak?" We will use this text as a kind of supplement to our main text.This very fine document is available on the OCA website, and can be downloaded there. In addition, this booklet is now available in an attractively printed and bound form from St. Tikhon's Seminary Press. If you would like to have it in that form at a relatively inexpensive cost, here is the link to the website. In For the Life of the World, Fr. Alexander opens us up to a renewed vision of the Sacraments of the Church - especially the Eucharist - revealing the depth of their purpose and meaning that had long been obscured by a kind of "theology of repetition." Although technically correct, such a theology was no longer inspiring. We will also read of his very trenchant critique of secularism, as he was really one of the first Orthodox thinkers to explore secularism in depth and point out its great shortcomings and inability to offer a meaningful worldview. And, surprisingly, we will also learn why Fr. Alexander said "No" to "religion." There is a good chance that you, like me, have already read this book; and perhaps, like me, more than once. Now we will have the opportunity to read it once again, and this time within an informal group setting where we will be able to share a lively discussion. If you have never read For the Life of the World, here is a great opportunity to finally "treat" yourself to a great classic of Orthodox literature. Please download the attached flier announcing and promoting this year's Fall Adult Education class and share it with anyone else that you may think would be interested. Links for Metropolitan Tikhon's essay, Of What Life Do We Speak? The Spirit of St. Vladimir's - One of our parishioners reminded me of the following video about the life and legacy of Fr. Alexander Schmemann. It goes all the way back to 1984 and was a part of a popular CBS series of that time. There are a few clips of Fr. Schmemann himself, but primarily there are interviews by various friends and colleagues that knew him well, and some footage of his actual funeral service (which I was able to attend). This could be a bit of preparation for our upcoming Fall Adult Education Class. "This documentary was produced around the occasion of Fr. 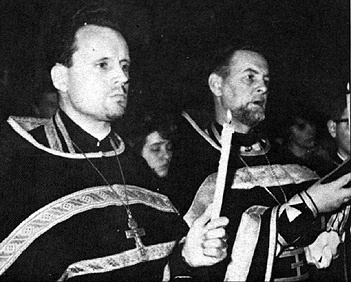 Alexander Schmemann's funeral at St. Vladimir's Seminary in 1983. 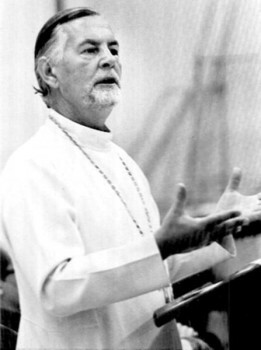 It reflects on the life of this contemporary Orthodox Christian theologian, teacher, priest and friend and the impact he has had on the church in this country and throughout the world." 19th AAC: "For the Life of the World" from St Vladimir's Seminary on Vimeo.